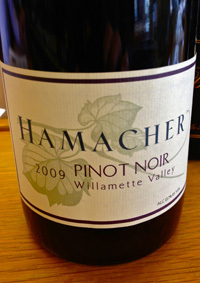 2009 Hamacher, Pinot Noir, Willamette Valley Oregon. Eric Hamacher’s 2009 is real headturner, this beautiful and richly textured Pinot Noir from Oregon is drinking sublimely right now and I’m sure will please for another 5 to 10 years as well. Hamacher crafts some fantastic wines, and it would be silly not to mention his delicate and lovely Chardonnay, which is a sleeper, but it is his Willamette Valley Pinot that gets most of my attention, I must admit this was a wine that leaves an impression will supple round fruit, hints of tannin and underlying acidity that lifts this wine up, plus a nice mineral and spice note. This beauty starts with roses and crushed violets, smoke, hints of kirsch and blackberry leading to a dense palate of black cherry, juicy plum, tangy currants and subtle strawberry along with flinty stones, licorice, beet root, cola bean and a touch of vanilla. Everything flows in silky harmony and elegant grace, this wine is both lush and refined, drink now through 2018.